With two funny movies, Martini is promoting an inflatable pool on the shape of their logo, BlogFonk reports. The campaign was created by Doorn $ Roos Advertising and is part of a larger Martini Mansion promotion. To promote its new Range Rover Sport, Land Rover has launched a website called, "The New Rush," which launches you into a night time cityscape complete with nightclub and mysterious people on the sidewalk. All of this, of course, is interspersed with touch points that explain the vehicle's features. While we think this an engaging and information filled experience, one Adrants reader thinks there's a drug overtone to it writing, "...it appears RUSH is some sort of red light district type nightclub with all sorts of party-goers hanging out front and a blinking red R florescent sign. Also, when you roll your mouse over one of the couples, a conversation bubble pops up that says, "What lines." Now being a bona fide drug researcher, I can assure you that this can have double and triple meanings especially since this creative relies more on heroin based sensibilities then cocaine ones." We've retired from the drug scene so we'll have to leave it to those in the filed to offer further comment. The campaign is also supported by outdoor pointing to the website. Here's a collection of interesting, animated ad banners that are, apparently, for a Brazilian Internet company. Wednesday, it was Mitsubishi's turn. Today it's Batman's turn. 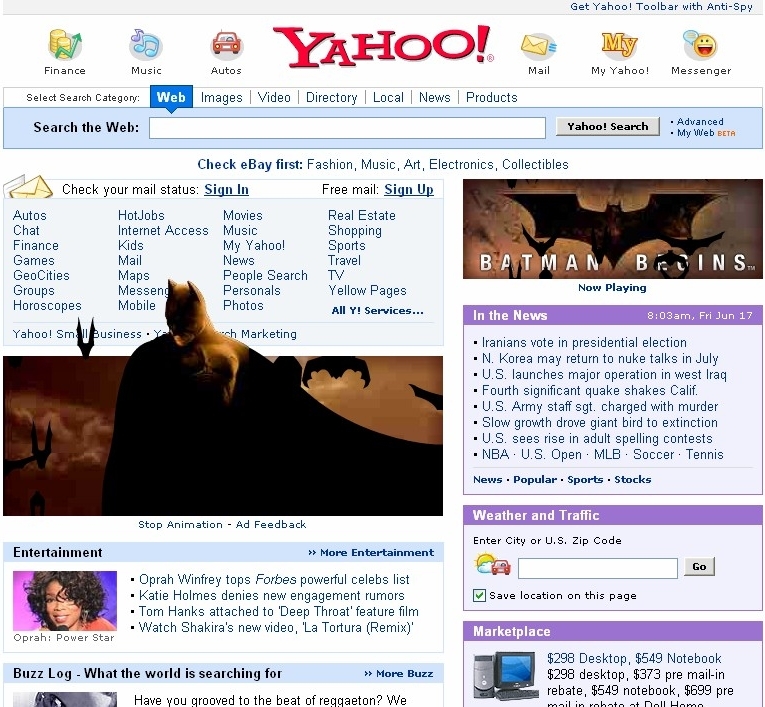 The "caped crusader" has taken over the Yahoo homepage with a bunch of flying bats and a fairly friendly half screen, window shade ad unit promoting the upcoming movie. And no, it doesn't work with Firefox. In an effort to counter the bad wrap foisted on the cookie, an identifying file placed on a person's computer marketers use to serve targeted ads and sites use to remember people's login information, online marketers are launching a "cookies can be good for you" campaign. Dynamic Logic President Nick Nyhan, who's company measures online ad performance, co-founded safecount.org along with Microsoft to convince antispyware firms to allow certain "good" cookies through their filters. While methods to replace the cookie are currently being developed, such as United Virtualities' PIE, the campaign hopes to educate people of the cookie's benefits such as saving login info and remembering certain website configuration preferences rather than focusing on its advertising tracking capabilities to which people will just thumb their noses. Random Culture points to this Applebee's DunkTank online game in which you upload a picture of yourself, crop your face, dress yourself in a choice of clothing and dunk yourself like one of those carnival games. Random Culture says it's pretty funny. We'll take his word for it. When we realized we had to upload a picture of ourself, we decided it was too much work so we'll just show you Random Culture's pic instead. Absolut has launched a pseudo-scientific little Flashy thing, called "Find Your Flavor," that lets you take a timed quiz which then determines which flavor of Absolut you are. We seem to me Mandarin but that's probably because we get dyslexic navigating fancy Flash sites. No matter, give it a whirl. After all, you have no actual work to do today, right? You're just "concepting."